According to the 2010 Caucasus Barometer (CB), 64% of Armenians would leave Armenia for a certain period (i.e. temporarily), while fewer Azerbaijanis (52%) and Georgians (47%) would do the same. CRRC data also shows that Armenians are more willing to permanently leave their country (29%), than the Azerbaijanis (17%) and Georgians (7%). Interestingly, ethnic Armenians within Georgia alone are also more likely to permanently emigrate from the country than the other internal ethnic groups. 42% of the ethnic Armenian population in Georgia reported the desire to leave Georgia forever compared to 7% of ethnic Azerbaijanis and 6% of ethnic Georgians within the country. Additionally, there is a pattern in which people who have travelled abroad are more inclined to emigrate in all three countries. Nearly eight-in-ten Azerbaijanis (78%) who have once travelled abroad would temporarily leave the country followed by 71% who travelled abroad twice or more and 48% for those who have never travelled abroad. Similarly, 71% Armenians who have been at least once abroad are more interested in temporary migration than their compatriots who have never travelled (48%) outside Armenia. Again, Georgians favor temporary migration the least, but still follow the same pattern in which those who reported at least one trip outside Georgia are more interested to emigrate temporarily than the Georgians who have never been abroad. Apart from number of trips abroad, education level influences the desire for temporary migration. In all three countries, people with higher education are more interested in temporary emigration. Specifically, this figure is 68% in Armenia, 63% in Azerbaijan and 56% in Georgia. There is no difference in results between people with secondary or technical and lower than secondary education; however, there is a trend in which Armenians with secondary and lower than secondary education (62% and 61%) are more willing to leave Armenia compared to Azerbaijanis (54% and 48%) and Georgians (43% and 42%). In addition, the fact that unemployment is considered to be most important issue in Georgia (52%) and Armenia (46%), as well as low incomes in both countries, may be some of some of the reasons why people may want to emigrate from the South Caucasus. According to 2010 CB, 47% of Armenians reported that number of available jobs decreased within the past year. This figure is 44% in Azerbaijan and 41% in Georgia. Additionally, according to state statistical agencies in the three countries, the average monthly nominal salary in Armenia in 2010 was equivalent to $292 while it was $335 in Georgia (2009) and $421 in Azerbaijan (2010). There are also a variety of other political and social issues that may influence the desire to emigrate. 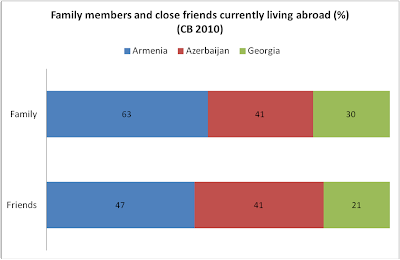 For example, more Armenians have family members (63%) or friends (47%) currently living abroad, compared to 41% of Azerbaijanis 41% of Georgians who say the same for family members and 30% of Azerbaijanis and 21% of Georgians who say the same for friends. There are various reasons why people want to emigrate from the South Caucasus. Despite similar patterns there is a tendency that Armenians are more interested in emigration than the Azerbaijanis and Georgians.